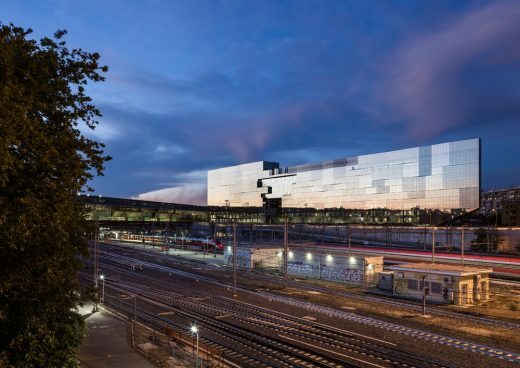 The headquarters of the New BNL-BNP Paribas Real Estate Group headquarterBNL-BNP Paribas Group building is a stunning example of how to successfully combine innovative architectural design with optimum comfort and wellbeing for the building’s occupants. 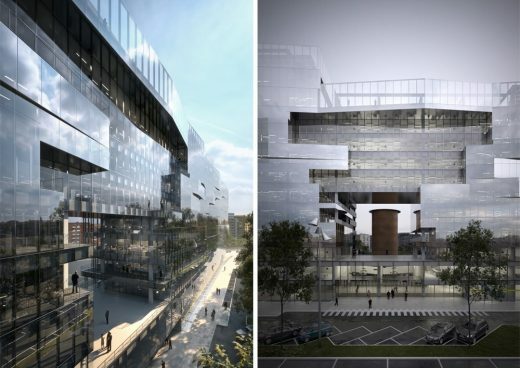 Designed by Italian company 5+1AA Alfonso Femia Gianluca Peluffo architectures, the 12-storey building (with an additional four underground levels) was created in such a way that it integrates into the surrounding urban environment. 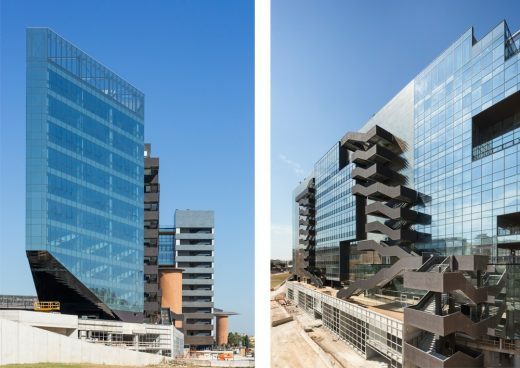 Completed in 2016 and located adjacent to the Tiburtina Railway Station in Rome, the structure is home to more than 3,000 workstations, as well as a training centre, auditorium, restaurant, garage, gym, nursery and a terrace with panoramic views. 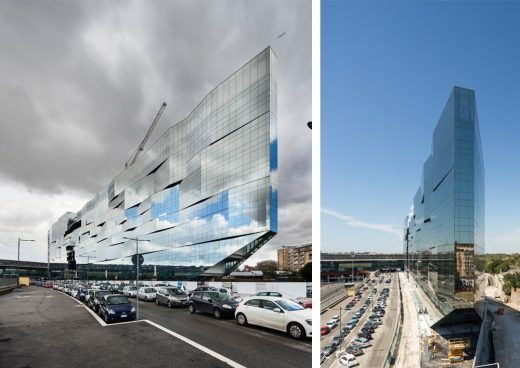 Due to the clever structural glazing, the aesthetics are visually appealing, reflecting the building’s surroundings on all sides and changing its appearance depending on the time of day and the weather. 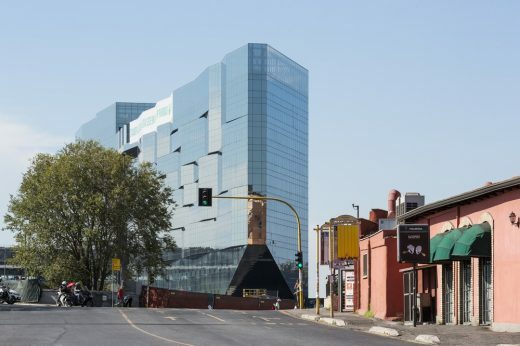 The project also stands out for its high level of commitment to environmental sustainability, which will see it certified as class A and LEED Gold, with reduced energy consumption compared to traditional buildings. 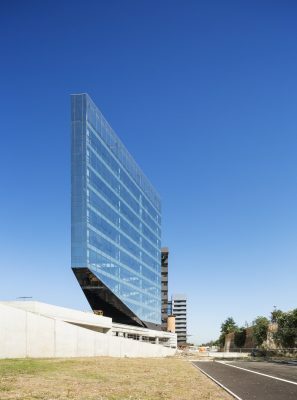 In July 2016, the office headquarters was recognised with “The Plan 2016” award for the best property development for office use, competing against 500 other projects from around the world. 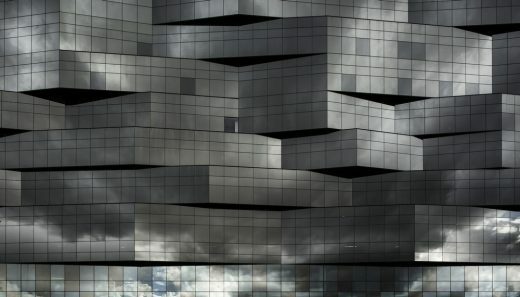 The glazing helps transform the building into a mirage-like structure, whose appearance continually changes as it catches the reflections of the sky and the city lights, whilst at the same time avoiding being seen as an obstruction to views. 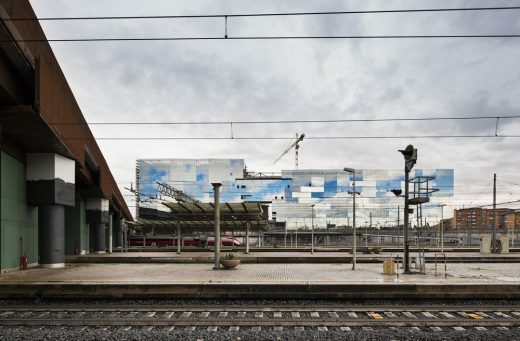 The aesthetics also provide the perfect transition between the Tiburtina Station and the surrounding residential districts. 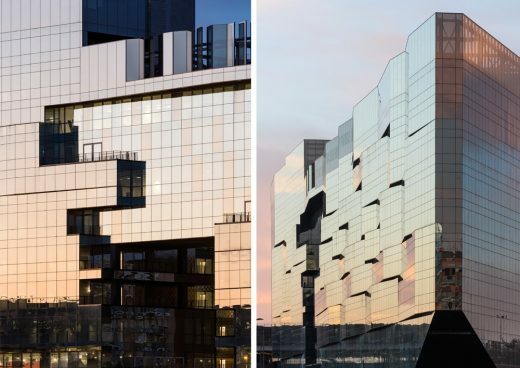 For the structural glazing, Guardian Glass supplied five different products from its SunGuard® range of solar control glass – four of these providing a silver aspect, the other a more neutral appearance. All of these coated glass products provide different levels of light transmission and external reflection to suit the architect’s precise requirements. 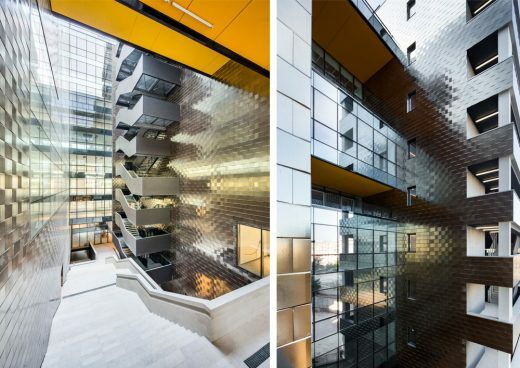 By carefully choosing these products, the architect was able to distribute the various types of glass throughout the building in a logical and aesthetically appealing way, while still achieving the solar control performance required. •	An outer pane of 10mm tempered glass or Guardian ExtraClear® float glass without coating, or one of five Guardian SunGuard solar control glass products (detailed below). •	A 16mm argon filled spacer. •	An inner pane of 10mm laminated Guardian ClimaGuard® 1.0 thermal insulation glass. Guardian SunGuard® Solar – a solar control glass that reflects the sun’s heat away from the glass, helping to prevent interiors from overheating. The range offers a variety of colours (in this case, silver and neutral) combined with exceptional thermal technical requirements. Three SunGuard® Solar glass products were used for this project: SunGuard® Solar Silver 10, SunGuard® Solar Silver 20, and SunGuard® Solar Neutral 67 – all providing varying levels of light transmission and solar heat gain. The Guardian SunGuard® High Performance series of solar control glass offers maximum design flexibility by pairing unique visual options with a range of solar heat gain and thermal insulation levels to choose from. 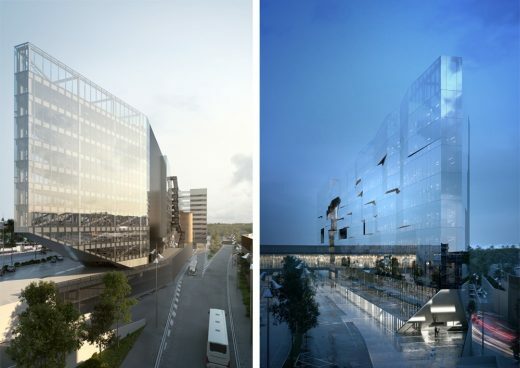 Two SunGuard High Performance glass products were selected for this project: Guardian SunGuard® HP Silver 35/26, which provides a 35% light transmission in combination with a 26% solar factor*. This reduces glare from direct sunlight but provides excellent solar heat reflection, helping to keep the building cool and reducing demands on air conditioning. It has a U value of 1.2 W/m2K, providing good thermal insulation. Guardian SunGuard® HP Silver 43/31 was also used, which provides a 43% light transmission combined with a 31% solar factor*. Guardian ClimaGuard 1.0 was chosen for the inner pane of all double IGUs. This thermally insulating glass with a U value of 1.0 W/m2K provides the highest level of thermal insulation physically possible in standard double glazed IGUs. Clear and colour neutral, the glass transmits light beautifully. For its combination of transparency, aesthetics and performance, the architect chose Guardian ExtraClear float glass for use in outer panes. 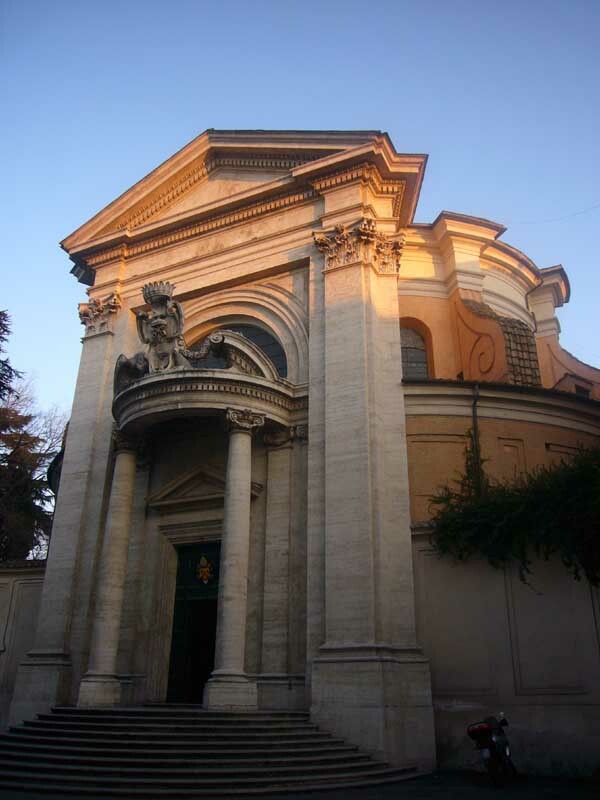 This provides enhanced colour neutrality in transmission and reflection. 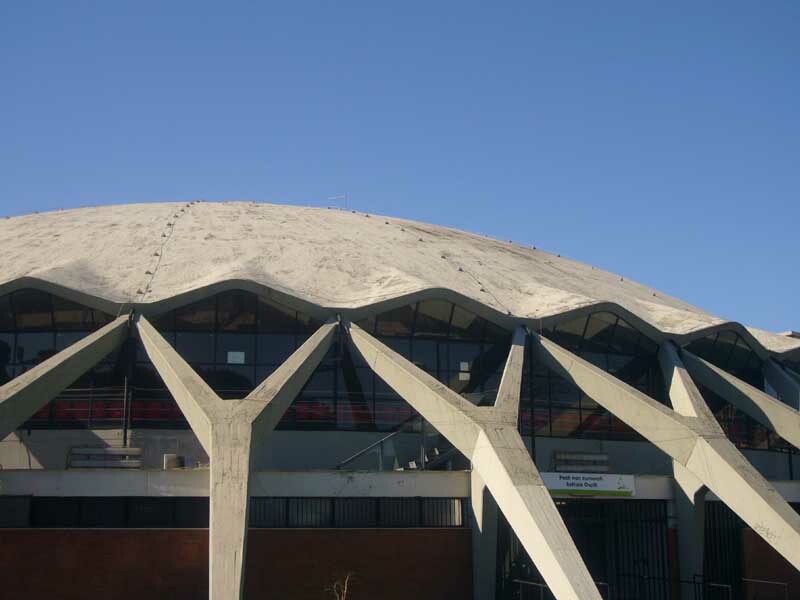 In addition to supplying coated glass products, the Guardian Glass team involved in the project also provided technical expertise and commercial support during the design phase, drawing on its vast experience and knowledge base. Guardian Glass is a major business unit of Guardian Industries Corp. For more information on the products used in the BNL-BNP Paribas HQ, please visit www.guardianglass.com or www.sunguardglass.com.